As I have posted on LinkedIn about previously, I am absolutely delighted to be working alongside Employee Matters. This company is on a mission to improve the personal and professional wellbeing of the UK’s workforce. 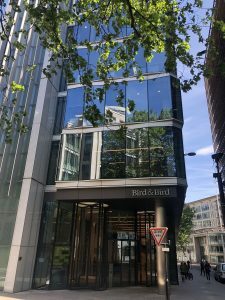 On Monday – Zoe Sinclair of Employees Matter – hosted and facilitated a prestigious Panel Event at the wonderful offices of Bird & Bird LLP in London, affectionately known on Twitter as ‘Two Birds‘, which I personally think is genius branding! Alongside myself, there was Elaine Hanzak & Sylvia Bruce, each bringing a different insight and specialty to the event – which was fully booked & attended by the Bird & Bird people over a light lunch. On arrival, I got to know Elaine, Sylvia & Zoe some more in the ‘Green Room’ area. I hadn’t actually met Zoe until that point and it was a real pleasure to finally meet in person. The theme of the event was ‘Me & My Mental Health’. We each (Speakers) introduced ourselves, our stories & the context with which we speak from, before answering questions from Zoe as well as from the floor. I was completely taken aback and impressed by Elaine’s and Sylvia’s stories. We all combined to produce a really powerful session and provide real value as well as tools & tips for attendees to use immediately. We were all there long after the end, speaking to attendees and answering questions and offering our experiences. It was SO well received by the good people of Bird & Bird. I am massively looking forward to working with Zoe & Employees Matter ongoing and to have formed two great new relationships with both Elaine & Sylvia. London – once again – I thank you! Skin Picking & the Power of Sharing! The One On The Season Ticket! The One At Cityparents Accelerator 2019! The One At Bird & Bird!